Acupuncture and herbs alleviate cervical spondylosis, a disorder caused by disc degeneration in the neck that results in pain and range of motion impairment. 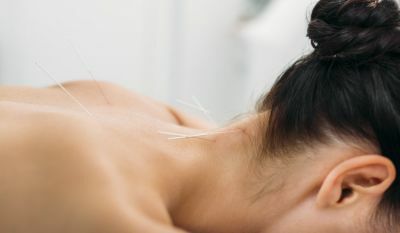 Hubei University of Medicine Dongfeng Hospital researchers conclude that acupuncture combined with herbs successfully relieves pain and regulates excess sympathetic nervous system outflows for patients with cervical spondylosis. Other improvements were also observed, including reductions in dizziness, palpitations, and neck dysfunction. It has also been suggested that increased sympathetic nervous system outflows due to compression of the cervical spinal cord region could put cervical spondylosis sufferers at an increased risk of cardiovascular events. Blood viscosity is also a predictor of cardiovascular events, with increased viscosity increasing the risk of heart attacks and strokes. The study documents that the acupuncture and herbal medicine regimen reduces blood viscosity, which may produce important cardiovascular benefits. The researchers conducted a randomized clinical trial using the scientific method. To provide a historical basis for the herbs and acupuncture points chosen for the study, the researchers presented Traditional Chinese Medicine (TCM) principles used for the selections. Cervical spondylosis is a disorder primarily belonging to the Du Mai (Governing Vessel) and Taiyang channels. Understood in anatomical terms, this correlates to the spine and paraspinal regions of the body. TCM principles stipulate that an underlying deficiency of upright qi leaves cervical spondylosis patients vulnerable to pathogenic invasion by wind, cold, and dampness. This correlates to the conceptualisation that internal weakness facilitates greater vulnerability to wear and tear along with other stresses on the human body, including environmental influences. The result is pain in the back and neck region. Acupuncture is applied to improve local blood circulation, relax the musculature, relieve spasms, and reduce inflammation and swelling (especially in the region of nerve roots). We’ll take a close look at the herbs and acupuncture points used to get the results. First, let’s delve into the outcomes. The subjective component of outcomes was determined using the visual analog scale (VAS) for pain and speed of resolution of other symptoms. Objective measurements include the quantification of blood viscosity. VAS scores were rated by the patients in two study groups on a scale of 0–10, with 0 indicating a total absence of pain. By the end of the study period, both groups showed a significant reduction in pain (p<0.05). In the herbal medicine monotherapy group, mean VAS scores reduced from 6.91 pre-treatment to 2.86 by the end of the study. Reductions in the acupuncture plus herbs group were significantly greater, falling from 6.89 pre-treatment to just 1.22 by the end of the study (p<0.05). Resolution of other symptoms such as dizziness, neck dysfunction, chest distress, and palpitations was also monitored closely. In the herbal medicine monotherapy group, dizziness took a mean 12.82 days to resolve, compared with just 7.89 days in the acupuncture plus herbs group. Neck dysfunction took a mean 13.79 days to resolve in the herbal medicine monotherapy group, compared with 9.41 days in the acupuncture plus herbs group. Chest distress and palpitations resolved in a mean 9.88 days in the herbal medicine monotherapy group, compared with 6.94 in the acupuncture plus herbs group. All symptoms resolved significantly and more quickly in the acupuncture plus herbs group (p<0.05). The results indicate that a combined treatment protocol is appropriate for optimal treatment of cervical spondylosis. Resolution of pain and other symptoms were taken into account to give the total effective rates for both groups. In the herbal medicine monotherapy group, there were 24 cases of complete resolution, 20 cases of partial resolution, and 16 cases of unresolved symptoms, yielding a total effective rate of 73.33%. In the acupuncture plus herbs group, there were 40 cases of complete resolution, 16 cases of partial resolution, and 4 cases of unresolved symptoms, yielding a total effective rate of 93.33%. Blood viscosity reduced significantly in both groups (p<0.05). Mean pre-treatment systolic blood viscosity measurements were 4.39 mPa.s (pascal-seconds) in the herbal medicine monotherapy group and 4.29 mPa.s in the acupuncture plus herbs group. Mean pre-treatment diastolic measurements were 9.26 mPa.s and 9.25 mPa.s respectively (p>0.05). Following treatment, measurements in the herbal medicine monotherapy group fell to 4.21 mPa.s systolic and 8.67 mPa.s diastolic blood viscosities. Reductions in the acupuncture plus herbs group were significantly greater, with mean systolic viscosity falling to 4.05 mPa.s and mean diastolic viscosity falling to 8.13 mPa.s (p<0.05). A total of 120 participants aged 25–65 years were recruited for the study and were randomized to receive either an herbal decoction (n=60) or an herbal decoction plus acupuncture treatments (n=60). In the herbal medicine monotherapy group, the mean age was 50.22 years, mean duration of disease was 2.31 years, and mean body mass index (BMI) was 22.57. Of the 60 participants in this group, 13 suffered from hypertension, 10 from dyslipidemia, and 9 from diabetes. In the acupuncture plus herbs group, the mean age was 50.63 years, mean duration of disease was 2.25 years, and mean BMI was 22.10. Of the 60 participants in this group, 12 suffered from hypertension, 11 from dyslipidemia, and 10 from diabetes. There was no statistically significant difference in baseline characteristics between the two groups prior to the treatment regimen in the clinical trial (p>0.05). Participants receiving concurrent treatment with other therapies, or that were unable to complete the study period, were excluded. Other exclusion criteria included patients with gastric bleeding or gastric ulcers, blood, liver, or kidney disease, psychological disorders, malignant tumors, and pregnant or lactating women. The herbs were boiled in water to produce 200–300 ml of liquid. Each decoction was taken once daily for a total of two months. The patients were asked to rest in a prone position. Following disinfection with iodine, 0.3 × 40 mm needles were inserted to a depth of approximately one cun. Huatuojiaji points level with the three intervertebral spaces above and below the affected vertebra were selected. Ashi points were applied to the local area. All points were stimulated manually using a balanced reinforcing-reducing method. After obtaining deqi, a G6805-II electro-stimulator was connected and set to a frequency of 30 Hz. Electrical stimulation was applied for 30 minutes with the intensity adjusted according to each patient’s individual tolerance levels. Acupuncture was administered on alternating days for a total of two months. The findings indicate that the prescribed herbal decoction combined with acupuncture successfully alleviates pain and other symptoms associated with cervical spondylosis, and is more effective than using an herbal decoction monotherapy. Furthermore, these therapies significantly reduce blood viscosity. The focus was to improve local circulation and promote faster healing based on the principle of invigorating the blood. These changes may also decrease the risk of heart attacks and strokes in patients with high blood viscosity. To learn more, contact a local licensed acupuncturist. Yi Jinke, Xu Yingle, Wang Wenke, Xu Penghui (2018) “Clinical effects of decoction combined acupuncture in treatment of sympathetic cervical spondylosis” Jilin Journal of Chinese Medicine Vol.38(8) pp. 966-968. Yuqing Sun, Aikeremujiang Muheremu, Wei Tian (2018) “Atypical symptoms is patients with cervical spondylosis; Comparison of the treatment effect of different surgical approaches” Medicine Vol. 97 (20) e.10731. Mohita Singh, indu Khurana, Zile Singh Kundu, Anup Aggarwal (2016) Link of sympathetic activity with cardiovascular risk in patients of cervical spondylosis” International Journal of Clinical and Experimental Physiology Vol.3 (1) pp.41-44.